Express file photo Racers negotiate one of the obstacles on the Crosstoberfest bicycle course near River Run. It's time to check the headset and polish the beer stein for Crosstoberfest, the Sun Valley celebration of bicycle racing's oldest form of competition and Bavarian-style beer appreciation. This year, the racecourse will resemble a more classic cyclocross event, with more road time between the barriers to help make traditional cyclocross bikes more competitive with mountain bikes, according to race promoter and beer connoisseur Billy Olson. The cyclocross competition is an event for riders of all ages and levels of competition, which, especially for amateurs, more resembles a rugby match than a sleek bike race. Leaping obstacles, successfully or otherwise, to race in circles, often looks like more fun for the fans than for cyclocross contestants, as they grit their teeth, especially when the weather turns a course to mud. "You have to be a little bit nutty because it's hard and the weather is not so nice," Olson joked. "The organizers are worried about rain, but riders and the fans love it." This year, the annual event will host both the serious side of the sport—with the Idaho State Championships being held at Crosstoberfest—and the lighter side of life, a celebration of beer a la Bavarian Oktoberfest, which Olson said he will mix with some oom-pah-pah and more popular sounds. As the event enters its eighth consecutive year, Olson said he is enjoying a changing of the guard. Some of the most longtime contestants are volunteering this year and a crop of new racers have been training in Croy Canyon and on a practice course set up at Josh Glick's house in Griffin Ranch south of Bellevue. Competition may be tough, but there is some new room at the top this year, as some Idaho elite riders may be focused on national competitions. The national championships are in Bend, Ore., this year, which is within range for many Idaho racers. Veteran rider and Durance Cycleworks owner Richard Feldman, who helped introduce cyclocross racing to the Wood River Valley with Olson in 1998, won't make the event this year, but offered some advice for first-timers as he prepared to race in Kentucky last weekend. 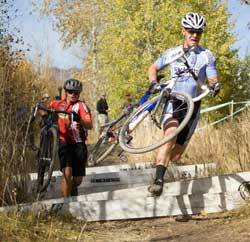 He recommended that riders check out cross clinics on Tuesdays in Boise and Sundays in the Wood River Valley, as well as the fall cyclocross series sponsored by Olson's Powerhouse Pub and Bike Shop, Sun Valley Road and Dirt and the Blaine County Recreation District. Just to dangle a long-term carrot, Feldman also said the 2013 Cyclocross World Championships were awarded to Louisville, Ky., the first time the event will be held in the United States. "I'm passionate about cyclocross," Feldman said. "Cross is really growing and I want to be supportive. "The fact is, you can lose some skin getting on and off the bike. The big thing is to get a little bit of instruction beforehand. The idea is one step off the bike, a step over the barrier and a couple of steps after it. Watching other riders is really neat." That's coming from someone who ranks as one of the smoothest cyclocross racers in the country. Feldman's head barely moves as he hops the barriers between pedal strokes, but it wasn't always that way. He said he started with 10 steps running over the barriers back in the 1980s. Crosstoberfest racing will be part of the cumulative series for statewide competitors gathering points. On Saturday, riders will compete for prizes, on Sunday for medals and all weekend for glory and beer. Much of the course will be in the upper parking lot where the Sun Valley mountain crew has been clearing the gravel and otherwise helping to buff out the course. An aerial map will be going up on the Powerhouse website, www.powerhouseidaho.com. "Sun Valley bends over backwards to help prepare the course," Olson said as he helped a novice rider fit to her bicycle and gave her some training tips at the Hailey bike shop between sessions grooming the course last week. "I always wanted to live in a town with an Oktoberfest and we did it."